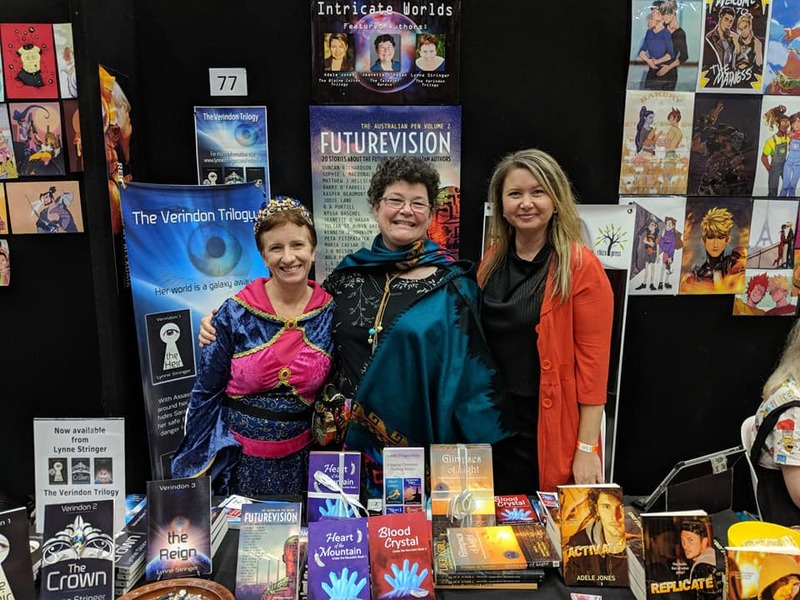 Last weekend I attended Supanova Gold Coast with Jeanette O’Hagan and Adele Jones. We had a great time and especially enjoyed (as usual) seeing what everyone was wearing. Jeanette and I were keeping tabs on the different Doctors, and we think the only ones missing were Patrick Troughton, Colin Baker, Paul McGann and Christopher Eccleston. There was certainly no shortage of long scarves, long coats and bow ties! I wore my new costume, which I talked about in last month’s blog. The tiara received several positive comments and I took it off a few times so that someone could have a closer look. I was happy to compare mine with a few princesses and fairies and the like, all of us happy that we were able to dress up. You can see some more photos from the event on my Facebook page here. 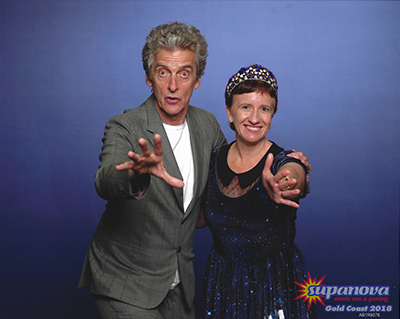 The highlight of the weekend for me was getting my photo with Peter Capaldi, the twelfth Doctor. I’d never done anything like that before and I was surprised at what an assembly line procedure it was. Hardly surprising, really; I got the photo in the last session of the day and there would have still been about two hundred people lined up behind me waiting for theirs. Full credit to Peter Capaldi for his stamina, though. He had been there for hours having his photo taken with who knows how many people, signing autographs, speaking in sessions, but when I walked up for my shot he turned to me without a trace of fatigue on his face and said, ‘Hello! Don’t you look fabulous!’ He was smiling and relaxed and seemed that way with everyone. I don’t know how he did it! In the midst of it all, I’m happy to say that the three of us sold some books as well. That was our main reason for going, of course, but fortunately we enjoy these kinds of events as well. Although it was exhausting, it was exhilarating in equal measure. What a great pic of you with Peter Capaldi. Sorry I missed it, but I’m really hoping to get to Comic Con in September. Was thinking of going as the new doctor, but I guess there’ll be a hundred of those. Great to see authors at these events. too. Was great to see you there, Lynne! And Jeanette and Adele, too. So cool that our tables were in the same aisle!